Actually store the SSID of the AP we are connected to. ssl module implemented with client and server side certificate validation. Fix bug when initializing and setting values of pins > 31. Thanks to @LoneTech for this! Fix bug related to the LoRa HAL Timer. Fix soft-reset bug related to threading. Fix the floating point division bug. @livius Thanks Livius. I am already using the expansion board (the Wipy 2.0 is plugged in). @livius Just some good news. In Ubuntu, I manage to connect the board through the serial port (COM) with the updater and the pymakr. I notice that the port was /dev/ttyUSB0 and I could type it in the linux updater and worked fine. Thanks for the help. Motivation comes up again! @livius And any suggestion for the board not being detected by any computer/system after connecting it with USB? Any special USB cable is needed? Could you show me a screenshot of how the device list should look like in case of a proper detection? Thanks and sorry for the extra work. I was eager to work on the board....I am still but more frustrated. @jmaralc In deed I am noticing that I can not connect with pymakr with the serial COM, I did it this morning but through the wifi.....Could it be a defective board? Hi @Daniel. I just updated my WiFy 2.0 to the latest firmware version (1. I noticed that I cannot find the RTC module. If I import machine and then do a dir(machine); RTC class seems to be missing. @livius Thanks for the answer. The problem is exactly that I connect the board with the USB and it is not installed as COM port....symply the system does not recognize it. I tried in three computer the three with linux and windows....I can use pymakr and load the examples of the tutorials but the computers are not recognizing the board. I tried also with different USB cables....any idea? if you attach to usb on your computer then it is installed as COM port. When you run updater then it provide COM port choose. remember that to update you must connect GND and G23 on your expanson board with simple wire. here a newbie in Pycom. About the update I have a question. It is related to the serial port. 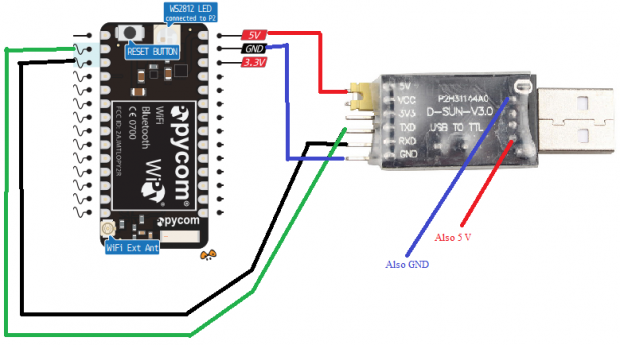 If I connect the WiPy 2.0 through the expansion board and from there by USB to the USB port in my computer. What is the serial port? I have used arduino and it provide an automatic communication through serial port despite you connected by USB to the computer. Or if the only requirement is not broadcast in plain text in order not to facilitate someone for so much. DES can be broken in under 24h. See this stack exchange thread from 2011. Since then the price/performance ratio has improved dramatically. Last I heard was that triple DES is theoretically still ok, but it is computationally more expensive than AES. Besides, ESP32 has hardware AES support. For messages smaller than the block size, I would look into stream ciphers modes. I'm sure you know this. I mainly rebute your "DES is really good" for the benefit of readers without any crypto knowledge. Disclaimer: I'm no crypto expert either, but I value privacy. @betabrain thanks, we are also aware that we have to clean-up lots of inconsistencies between the website and the docs. We have plans to do that next week too. AES have much more overhead and sometimes it is too big. It's good to see the docs being worked on. Having some basic facts and stats and simple examples at the beginning of the documentation makes it more approachable. Good work! The new docs are work-in-progress, but we expect to have everything fully documented by mid next week. Please refer to the "old" docs in the mean time. Thanks.